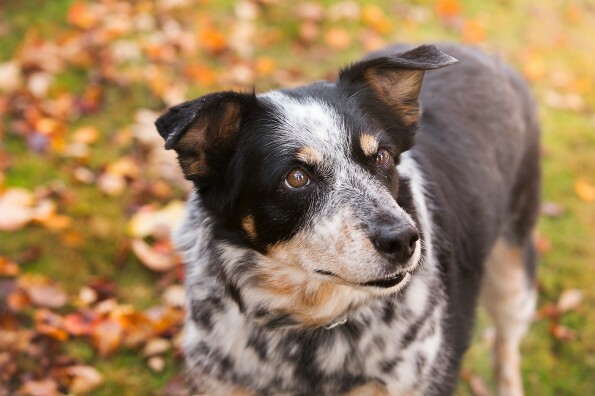 Hogan is a 12 year old heeler mix and has been living with us since she was rescued. She is a sweet loving girl considering everything she has been through. Hogan’s history is long. Hogan is a three-legged girl that was rescued out of the Nevada desert early 2008. She had been living out there for 5-6 months, possibly longer. When she was brought in she was in pretty bad shape. Hogan had a torn ACL, her pelvis was broken in two places, her right hip was dislocated and her colon had torn loose. She had lung issues, several loose teeth and was full of intestinal worms. She was also missing her front left paw. From the x-rays that were taken, the vet determined that she got caught in a snare trap and chewed off her own paw to free herself. We had tried to get her a prosthetic and at the time, things just did not fall together. Then about 3 years ago we ran in an individual that was working at Shriners Hospital. He asked about Hogan’s condition and with one thing leading to another, a new foot was made for Hogan. The foot has really increased her quality of life and has relieved some pressure off her lungs. Hogan became a therapy dog for Shriners hospital seeing and cheering up all the kids. She continued for 2 years but is now retired. This sweet girl has been in the ER since Friday night and is being treated for pneumonia and respiratory distress due to chronic bronchitis. Hogan has suffered from Bronchitis since we rescued her. Her lungs have a buildup of scar tissue from living out in the desert for so long and do to the damage she is more susceptible to lung illnesses. She could really use some help to give her the continued critical care she needs. With full care, Hogan is expected to make a full recovery and will be able to come home to her family where she is loved and missed. Any donation to her care will be appreciated.